Add tags to chats to help organize and sort them. Agents can select relevant tags to add to a chat from the Predefined Tags List, which only administrators can edit. For details, see Editing available tags in the Predefined Tags List. Note: Chat tags apply to specific chat conversations, not to the visitor in general. Chat tags are separate from API and trigger tags. For details, see Understanding different types of tags in Chat. You can both add and delete tags for a chat you're currently serving. You can't edit chat tags if the chat hasn't been served yet, has already ended, or if you're only listening to the chat. You can add chat tags in the chat panel by entering them individually or by using a shortcut that contains tags. Any tags added to the chat will automatically be applied to the created ticket in Zendesk Support; however, any tags added to the ticket within Zendesk Support will not be added to the chat. Add or remove tags in the right-hand side of the chat panel. Each action you take appears in the chat log to agents. Visitors cannot see tags added to their chats. 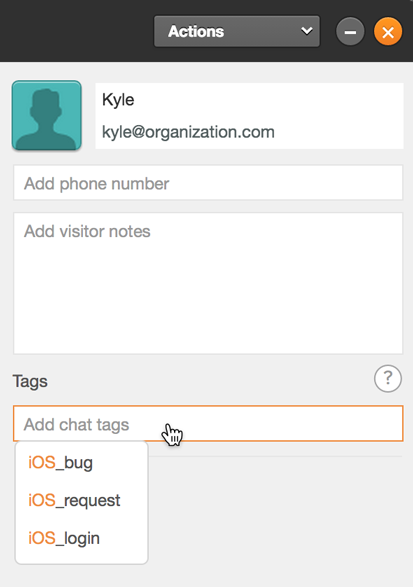 Click on the Click to add chat tags field. The list of available tags appears. To search tags, start typing the tag you're looking for. Click on a tag to add it to the chat. Click the X next to a tag to remove it from the chat session. Shortcuts can have tags associated with them so that when you use the shortcut, the tags are applied to the chat. The steps below describe how to use a shortcut that's already been set up with tags. Both agents and administrators can set up shortcuts to contain tags. For detailed instructions, see Adding tags to shortcuts. Start typing a shortcut or a slash (/) to view all shortcuts. Insert a shortcut by clicking it or selecting it and pressing Enter. Remove tags from the shortcut by clicking the X next to them in the message field or delete the entire shortcut to also delete the tags. Send the shortcut message to add the tags to the chat. The tags now appear in the right-hand side of the chat panel. Click the X next to a tag to remove it. Administrators can add tags to past chats or offline messages in History. Agents don't have access to do this. For details, see Creating and editing tags in History. Will the client who is in the chat be notified if we add the tags?